MEN'S AMERICANA SHOP IN DOWNTOWN ABILENE! A GIFT SHOP FOR MEN? HECK YES! We are so excited about this interview with Lone Star Canvas & Sign Works and Lone Star Dry Goods shop owner Ted Evans. APPP Intern Jake Rosser did an incredible job giving us a tour of this new and unique downtown men's shop with all the right questions to ask a small shop owner. Again, we are inspired and motivated by the story of a small shop owner entrepreneur in Abilene, Tx! There's a beautiful mix of buying and investing in an existing business as well as launching something completely new as a whole other business venture. We love hearing how they have embraced the Instagram community with other small shops and makers, creating fun business relationships as a store front for the handmade craftsmen. What's more, we are so excited for how they are bringing these kind of unique items to the downtown shopping scene in Abilene! Enjoy this read and all it's beautiful images by Jake Rosser. I'm Ted Evans. I am forty years old, native of Abilene. Both of my parents are from here and I went to Cooper High School, graduated, went to A&M. I spent about six years in Houston in the energy business before I moved back here in 2004 I bought ABC Tent & Party Rental, which is kinda how this all came about because the original business was Abilene Tent and Awning. Who are all the people behind the business? Well, I've been married for five years, so my wife has been part of this. Her name is Allicyn Evans. She's been a big part of the retail and stuff and getting that going. She's an attorney by trade, so we've kinda gotten to the point now where this is a full time gig for her. So yeah, we kinda did the party rental stuff and grew the canvas stuff. It's a small business, so really it's just me essentially. I'm the CEO, secretary, and payroll person, so it kinda feels like a one man show. What was it like starting your own business in Abilene? Well, luckily I was able to buy a company that had been around since the 70's. So that's a whole different animal than starting your own business because you got an existing customer base and an a company name, so that's a huge plus. It was definitely beneficial to do it back in Abilene where I had ties and connections. I moved here from Houston, so knowing people that work at banks in Abilene and feeling comfortable approaching people about business loans or what not is a whole lot easier than a big city where you don't know anybody. That makes a lot of difference to do it in a small town. I didn't intend to move back here, but I literally moved back here to regroup and get out of the energy business. I was gonna look for like an industrial sales job or something in Dallas or Austin. Being the small town Abilene is and with growing up here and my parents being here, literally the first week that we were back we knew the people selling the tent business. I always wanted to have my own business, I just didn't know when or how, but here it was. I don't want to say that it fell into my lap, but I saw the opportunity and I jumped on it. Been here ever since. What was the vision behind the store? We felt like there was a need in Abilene for men's shopping and gift items. Men's lifestyle kinda falls under those categories. Our concept is to carry brands, as much as possible, that are American made...handmade, hand crafted. In Abilene, as far as men's shopping or men's gifts go, it's limited to like Academy and men's Dillards. So we wanted to create a store where we know Abilene hasn't had something like this with these kind of men's options. We carry items that are very unique that you won't really find outside of like the Metroplex. That's the concept anyway. It seems to be well-received so far. You said you were from Abilene...how does it feel to be apart of some of the other unique businesses in downtown that have come up after moving back? How is it to be apart of a little community down here? Well, it's very cool! When I grew up here, I didn't have a reason to come downtown unless I was going to the post office. So literally there was no reason to. There was a generation right before me, like 50's and 60's, where downtown was where all the shopping was. So when that died out or changed for whatever reason, it left downtown stagnant for awhile. It takes time, but it is very cool that the buildings downtown have been bought up and cool things are happening. It's also one of the challenges of most of the shopping being on the south side...there's so many people that don't know that there's a restaurant downtown or there's shopping over here. Where did the inspiration come from to design the place in a cool, manly hipster vibe? I guess the best way to describe it is that this is my taste. These are the things that I like and we like the vintage/industrial look and a lot of this stuff is actually from my house. My friend went to a store somewhere else and told me about it, and it was essentially everything that the guy wanted to buy himself and so that's the stuff he put in the store. So like Simms, shirts I've been buying for years and their hats as well as some of the other items in here. So a lot of it is stuff that I've liked and wanted, good products that I wanted to bring into the store. A lot of people will ask where we find some of these things. Most of it is through the internet, just research as well as Instagram. Companies pop up and I think that's what's pretty cool about Instagram. It seems like everybody kinda supports each other. Nationwide, it seems like there is a following for this type of stuff as well as a community through these different businesses. It's fun! How is it being located in downtown Abilene? On the canvas side it's not too big of a deal. We are the only ones in town that do what we do on that side of our business and I guess on the retail side as well. When people know that they need a new awning or a new cover or tarp or whatever they're just going to have to find our address and come to our location. It's a little bit harder with the retail because although downtown is coming along, it's not like the traffic on Catclaw Dr. or some other parts of Abilene. Lucky for us, we already own the building, so it wasn't a huge risk. We aren't taking out a lease or anything like that. With the direction of downtown, it's coming along, and we have time to ride it out and see where it goes. Tell us about the brands you use in the store. What all do you guys sell? Yeah, there's probably too many brands to mention. Probably the most familiar ones are Filson, Simms Fishing, Rep Your Water Hats. We have a great selection of different companies and selection of t-shirts. Candles, knives, watches, shirts, hot sauces, drink mixes, flashlights, thermoses, coolers, wallets. Theoretically, if you're a guy and you need something, we have a lot. Now along with your brands, I hear that your inventory is changing pretty frequently too. How does that work? Ones that are really popular, we'll try to re-order. And that's the good thing about some of the smaller companies we work with. We can just fill in with small orders. We don't have to make big, hefty orders and have hundreds of shirts to fill in or something. It's cool that we are able to order in small quantities and refill. If we sold out or something, like you said, we'd try to order something different or new. Yeah, it's definitely not gonna be the same stuff over and over. We'll keep the variety up for sure. Tell us about the canvas part of the business. What all do you guys create with that? Awnings and tarps are probably the big two. We do tarps of all kinds. People drop off their trailers and we repair tarps, make new tarps, kind of a whole turn key deal. So those are the two big ones and probably the third big one is the utility industrial bags for the windmill industry. We actually make a 600lb bag that is used to hoist tools up to the tops of the towers. It's made specifically for GE. It's pretty cool that we get email purchase orders and we ship them up to GE, which is one of the largest companies in the world. A lot of our work is custom, but we are trying to get more into widgets. A lot of people will call in for random patterns and orders for stuff they need made and if they have specific dimensions, we are able to just plug them into the computer. What are some goals you plan to achieve with such a unique place like this? You guys are pretty original and one of a kind in Abilene. As far as the canvas side, expanding on the bags that we make and sell and expanding on widgets. We have a lot of people emailing and asking "can you make this?" It's just apart of a larger picture. There may be a piece of equipment that has all these different components and one small component of it is a tarp or piece of fabric for whatever reason. But our machine should be running everyday. Now up here on the retail, we are just gonna let it run organically and see where it goes. It's exciting! Just for fun, how would you sum up the place into like one word? Because you have so many things going on in this place. Is there anything you would like to share with your customers or to people who are just now discovering you guys? Come out and shop! We have the most unique variety for guys, so if you want something unique and something you can't find in Abilene then we got it! We're back with a food truck story! Welcome to the APPP Blog! We are so excited to have Jake Rosser interning with us this summer! You can be sure to find his monthly blog entries covering some of our favorite local entrepreneurs and business in Abilene. We love getting to take you behind the scenes as we learn about their stories! 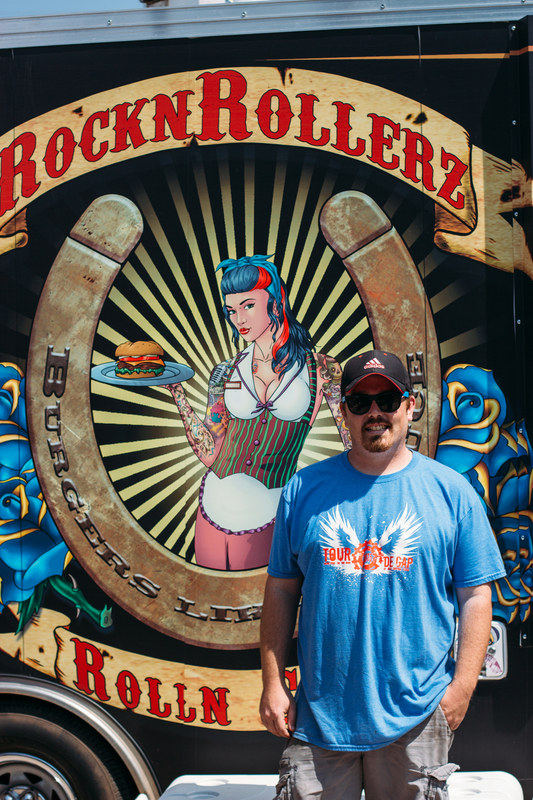 We've been excited to talk with owners of one of your favorite Abilene food trucks, Rock'n Roller'z! Enjoy getting to know the creators and chefs that run the infamous award winning food truck with Jake Rosser's behind the scene interview and photography that captures their southern rockabilly food truck vibes! Who are the people behind Rock'n Rollerz? Me and Armando Asencio, we have been friends since were kids and we have worked together at a restaurant in Buffalo Gap for about eight years, Duchlander's Catfish. We always wanted to open a restaurant and you know, it takes a lot of money, so we planned and went with the food truck. The whole idea behind it is, we're big music fans and we love food, so we tried to incorporate those two into the theme for our truck. Me and Mando and of course all of our family and friends had a bunch to do with it so I would say it's a big family business. What made you want to start a food truck? Yeah, just like the same thing. We've always worked in the food industry. I graduated from Mcmurry and started teaching high school social studies and that lasted about three weeks, so I called Mando and we just went with it. We did a lot of research before we got started and with food trucks, especially specialty or what we kinda call like "gourmet street trucks," you kinda want to have your niche. And of course, you don't get any more "Americana" than hamburgers. Because America, all of it's cuisine, is just really from all around the world. You know like spaghetti and pizza...and hamburgers and hotdogs are those two things that Americans do on the weekends. So we wanted to take the burger, and burgers are so mega right now...super, super in. There was a study done in 2014, I think, that burger joints had seen an increase in sales fifty percent over the last six years and it's only getting better. So we love hamburgers and wanted to do something that was fresh and that was cooked to order. Like we love to do tacos and all that stuff, everybody's food is really great. And with that you could cook the meat ahead of time and such. With burgers there's a million things you can add to make a difference. There's just so much you could do with it. What did it take to get this business up and running? Well we, of course, built a business plan and went to about ten, fifteen banks and looked for investors and realized real quick that we're younger so without a lot of collateral or credit there really weren't a lot of options so we pretty much scrapped metal, took the last of our paychecks and bummed up all the money we could to get the trailer, and it kinda went from there. But yeah, it literally took blood, sweat, and tears just to get it goin. So we've just been really fortunate with the success we've had. If it hadn't had gone over this well, there's no telling where we'd be right now. Tell us about your truck wrap. What was that like getting the finished artwork up? Well, it shouldn't usually be as hard, but we had a rough time. The design company we used kinda dropped the ball and we waited a little while. I would say it was stressful, but we had a good artist, so that helped out. It was just getting the wrap installed that kinda took some time. Besides that, it's really fun to take a blank page and get to choose what you get to do with it. It was a completely white truck and we just started working with the artist on what we wanted to do. I see Han Solo there on the truck too! Yeah, we really love Star Wars and we try to add all of our flare there too. That's kind of cultural, but not always super popular like if we had Emmit Smith on the back or Troy Aikemen. But especially with the kiddos and the Star Wars movies making a comeback it's been really cool. Yeah! I also heard R2-D2 at one point, did you intentionally incorporate that in the truck? No, that is actually my cell phone every time I get a text you hear him! Tell us about your rockabilly food truck name. You know, with the food trucks, it's all about your play on words big time. You can always have just a normal name, and we could've been like John's burger truck or Joe's burgers, but we were kind of looking for a different name because we're not stopping here. We've got big dreams. This is gonna be a brick and mortar or a franchise, an empire or whatever you want to call it, so we were looking for a name that later could work with a restaurant. It could work with anything. "Rockn Rollerz Bar and Grill," "Rockn Rollerz Rollin' Grill." So we were looking and played on the word cause it rolls like a food truck and the rockn for, you know, the rock and roll. The word kind of embodies more than just the music. People use it all the time...the cliche "Let's go rock and roll this!" It kind of means to get it going. So we were trying to play on the food and then play on our name, the music, and all that. We probably had like a hundred different names till we landed on it. How long have y'all been in business? Actually, last weekit was a year and six monhs! (From the time of the interview.) That's always pivotal for a new business. If you can make that two year mark, which we'll do with a stride, but yeah. We've been blessed because a year and a half in you're gonna get a new food truck on the scene and everybody goes to them, but if you don't keep up the good quality food and all that stuff it goes real quick and then you're there twiddling your thumbs. So like I was saying earlier, we buy the freshest ingredients. Stuff is never frozen, and we go grocery shopping every single day. APPP booked you guys at their Spring 2015 People Party Craft Fair about a year ago when you guys were first getting started. What has it been like working with A People Party Productions? Jennifer and Forrest are awesome. For one, they have real good business ethic. They go out and talk to people. They don't jump the gun. They're probably one of the only people that could've pulled this off and done it the way it is. They care about the looks, the theme, the feel, and the atmosphere. They are awesome people and we love doing any kind of event with them. And that craft fair is really what started it. We love it. They've recently launched The Food Park in Downtown Abilene. What has that been like? How has a centralized location like The Food Park worked out for you? Well what we have noticed when you're doing this is that the more food trucks the better. When you are out there by yourself, there's a lot of risks. Either you have nobody show up or having a whole bunch of people show up and you're the only food truck there. So at a food park like this with the way they did it, we are selling out every day. It's crazy busy every time. I think they did a great job and did it perfect the way it is. Within your first year of business you guys have won several awards for your famous burgers. What were those awards? How do you feel about holding all those great titles? Well...we always said once you're on top, you got nothing to gain, but everything to lose, but I mean, we like it and if we don't win anything in the competitions we are alright with it. A year ago winning this trophy put us on TV and in the paper and we really got our name out there. It probably jumped stared us to where we are now. The awards are pivotal and people that hold them are usually the chamber of commerce people of that town, and they are getting better and better each year. You have established a very strong following in Abilene. Tell us how it feels to have come this far from day one. It's been a whirlwind to me honestly. When we won this trophy I was like this is what it feels like when an actor wins an oscar or something. You know what I mean? I am still in shock. It's been awesome. Tell us about your menu and the passion behind the burgers. We are always trying to add things to the menu to get people's attention. Like the Poppin' Johnny! We weren't gonna have one burger all the time, but we found out real fast you gotta have an original. The expectations of our menu were a lot different before we started and then after a year we got our permanent menu. We know that many food trucks deal with long lines and long waits...what can you say about this? You guys are kinda like local celebrities in the food scene. Well I think the lines have to do a lot with what the food truck serves, also your reputation. We cook our burgers fresh to order, so when we get a big line and a lot of people, they can take some time...but I think some people will find out we will pack that truck full with as much meat as we can up to health code and hope for the best because this food truck park has us selling out every single time. We are gonna be getting a new fridge here real soon that will hold more and a bigger cook line and all that stuff so it's getting there to where we will be able to serve to more. But people will learn that what we have is fresh right as they order. Just keep checking back. We'll always have new stuff and we'll keep trying to bring trophies back to Abilene. Hopefully in June will be coming back with basically a big wrestling belt from the grand championships. We hope for the best. Just keep supporting us. We love the people that come. We call them our burger lovers..."burger lovin' rockstars." KEY CITY COFFEE? YES PLEASE! We've held onto this interview with Key City Coffee since before Christmas break! And we are finally getting to publish our interview with one of Abilene's newest entrepreneurs in the coffee bean business! We are sure you are familiar with their beautiful brand by now. They have done an incredible job connecting with our community and continue to network with supportive local businesses in our area! Getting to spend time with husband and wife owners, Daniel and Emily Parker, was an honor and a treat! We are excited to finally get to share a little bit of their story with you! And let me tell you, not only was their coffee spectacular, the brunch and warm hospitality was to die for! Enjoy the following interview written and conducted by freelance writer and friend Casey Hatcher. Details have been updated since the initial interview. How did you get into the coffee bean business? Why coffee beans? Like most college kids, we both became very dependent on coffee during our studies. Daniel studied Industrial Engineering, and I studied international studies, world religions, and journalism. We needed it! We have always been big coffee enthusiasts. When we were in college, Daniel’s mentor Nathan Boe, taught Daniel how to roast coffee beans on a whirly pop popcorn maker. When we came to Abilene, we started roasting on our whirly pop and sold a little bit to our friends in town. 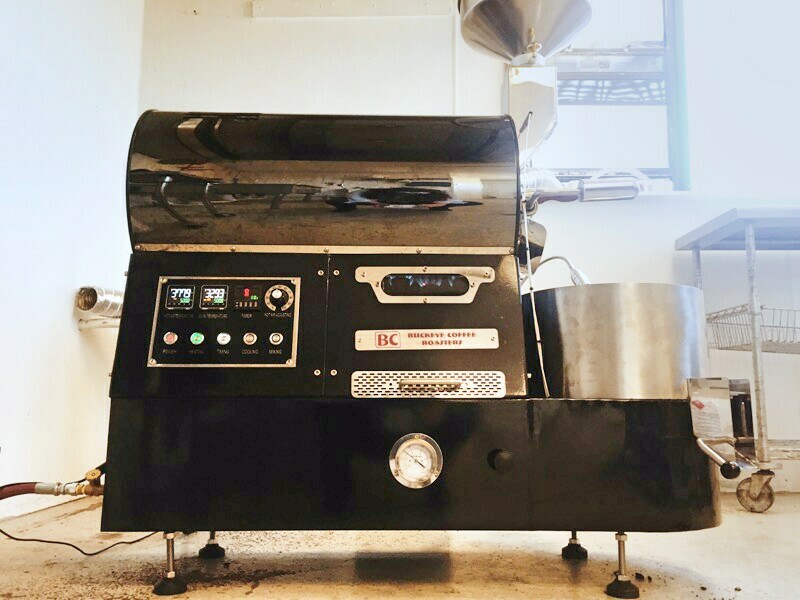 Suddenly the demand grew and as we got better roasting we realized this hobby and passion could turn into something a little more lucrative. 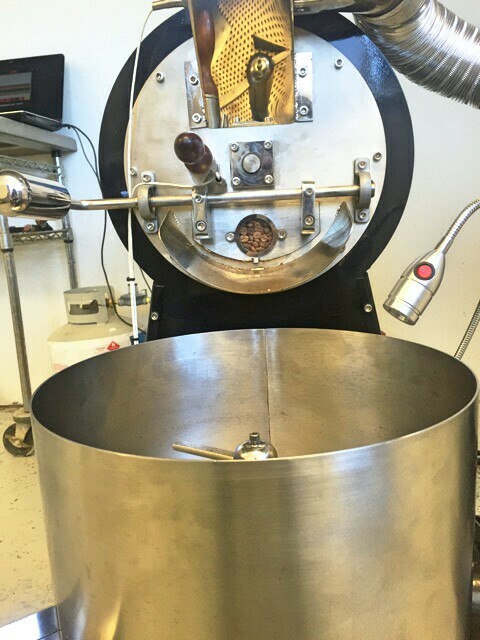 Now we roast on a commercial roaster and can roast over a hundred pounds a day. "Good coffee in the hands of the people" has become our mantra. It's been so great to get to do what we love and be so well received! What brought you to Abilene and how long have you lived here? We came to Abilene in June of 2014 because of the Air Force. We graduated from Texas A&M in 2014, and Daniel commissioned as an Air Force Officer and which became our first duty station. Being Native Texans, we love the small town feel and locally driven atmosphere Abilene offers. Now Abilene is our home and we plan to stay here for a while. I understand that fair trade is an important issue to you and that you passionate about helping the countries you get their beans from. Tell us about your passion, vision, and mission for your business. In college, Emily majored in international studies. (Side note: every girl that Daniel dated in college was also an international studies major, and not very many people at A&M studied international studies, so it was quite the feat on his part; She currently works in town for the IRC (International Rescue Committee) as a caseworker. Getting to work daily with people from so many different countries is such a joy for her. God provided in a big way in bringing Emily to that job. Cultures and countries have always been a giant passion and interest for both of us. We are all about people and loving them well. Our importer, Cafe Imports, works closely with the farmers themselves and ensures that they are treated well and paid a fair wage. For us, it doesn't make sense to do business any other way. We have a giant opportunity here to be a small force for a greater good, and we're jumping on it. As we grow, we would love to get the opportunity to cut out the middle man and work directly with the farmers and plantations ourselves. But for now, we can rest assured that our importer does that for us. What can we expect to see from you in 2016? What are the long term goals with Key City Coffee? In 2016, KCC is going commercial! In 2015 we were operating as a cottage food business. Legally, we had a lot of restrictions on where and how we could sell our coffee. But we are excited to finally be commercial in 2016! You can expect to see us in some of your favorite local restaurants and grocers. We also are planning on holding several coffee education events in town. Education (without being arrogant or presumptuous) is a huge passion of ours. Now that good coffee is in the hands of the people, we want to teach them how to extract the most flavor (and enjoyment) out of it. We want to emphasize, that we desire nothing more than to be a local small business. Our drive in going commercial is solely to make our coffee more readily available to Abilene and its people. As far as long term goals, we're not looking to reinvent the wheel. There are already plenty of coffee shops and restaurants in town that can serve tasty coffee drinks, and that's a great thing and something we want to stand behind and support. We want to see Abilene grow into a place where good coffee is known and understood. We want good coffee to be the norm here and readily available to any and all who drink it. Tell us more about the coffee itself. How can folks buy from you? We sell single origin whole bean coffee. That means that we never sell "blends." 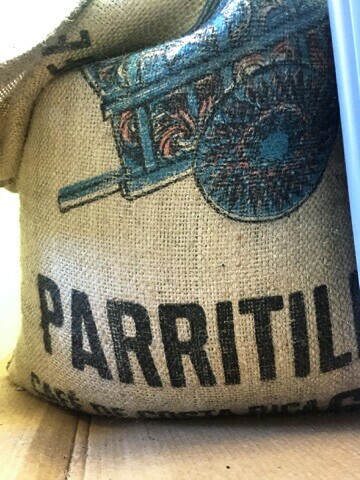 All of our beans come from the same region, and most times the same small farm or plantation. We don't flavor our coffee. There are so many fantastic flavors and nuances in regional coffees that are to be experienced and not masked by chemicals or flavorings. You can contact via Facebook or Instagram for orders or order through our email form on KCC’s website. However, now that we're commercial, we are be able to ship our coffee directly to the people as well as sell at local coffee shops, restaurants, and grocers. We are excited to say you can now purchase our coffee at Abi-Haus located at 959 N 2nd St, Abilene, TX in Downtown Abilene and Beltway Coffee Co. located at 2850 State Highway 351, Abilene, TX. We are excited to have relationship and support from local business like these guys! We're also working on collaborating with Beltway Coffee Co. to offer coffee brewing workshops on the science of brewing for high quality flavor! We love the branding! Tell us about the branding and packaging process! We love our branding too! One of our good friends and best local talents, Kirsten Ashley Wollschlager, did our branding for us. You should totally follow Kirsten on Facebook and Instagram @kristenashleyphotography! She's amazing! She helped us identify our target market and communicate our vision well. All of our bags are hand stamped with our logo. Our stamps came from Stephen's Stamps on Butternut, we love working with them! We both really love history and antiques. We believe that the past is to be treasured and learned from, but not dwelt in. You'll notice we combine a lot of more retro and antique looking styles with clean lines and more modern styles. We do this intentionally. You guys were vendors at the Palm House Bake Sale promoted by A People Party Productions at the Fall 2015 People Party Craft Fair. How did your business do at this event? What did participating in this event do for your business? The APPP craft fair was our big grand opening in Abilene, and it was more than we ever could have dreamed! We had so much success there. We felt so loved and well received by the people of Abilene. Our success there gave us the push (both financially and emotionally) that we needed to expand and go commercial. How has networking with APPP helped your business? It's so great to see APPP so genuinely want to see others succeed. Jen has been nothing but supportive and encouraging. For that we are so grateful. We really want to clearly communicate that we love the city of Abilene and are committed to being a local business and giving back to this city. We aren't planning on leaving anytime soon and we're in for the long haul! Abilene natives have been mourning the loss of Fuji Japanese Steak house for years. However in November of 2014, Fuji’s was reborn into Hashi Teppan Grill by cousins Jennifer Navejas, 27, and Philip Cheung, 23. Word quickly spread and the masses showed up. The hibachi messiah had indeed returned. Though many changes have come, the recipes are so authentic one cannot help but reminisce the old brick and mortar eatery. Tell me the story of your background and opening this place. Jennifer: After the family business Fuji’s closed we both started to work in food again. He went to work at Outback then I started working at Panda Express. I did my training and I asked Philip to come work and learn at Panda Express with me. We worked there about a year and really learned the fast food concept. It was a grueling couple of months, but it was the best experience ever. And that’s how we got our concept to do Hashi's! Then I worked at Tokyo Asia Fusion as a manager. But one day I called him and said, “Hey! Let’s start over!” We had our family recipes since both of our dads started Fuji’s. Plus we loved the Panda Express concept and the people. We love fast, casual food, which is how we developed our menu. Where did the the name come from? Philip: That’s an interesting story actually. We were originally going to call it “Teppanyaki Japanese Grill”, but we realized it was very typical and cliché. So we called one of our old family friends and told him our concept and he actually came up with the name the logo as well. Philip: Hashi means chopsticks, hence the chopsticks in the logo! I feel like one of the first things I notice when I walk into your restaurant is the aesthetics. Where did you come up with the design concept? Jennifer: Philip gave me a lot of free rein on it. I would ask for his opinion on things and such. But there are a lot of restaurants that we really like, so we went to Dallas and looked at stores, then we also modeled many aspects after other restaurants. For example that table over there is from Jimmy Johns, the wooden benches are from Fuzzy’s, people who come out and greet is from Chick-fil-A, the wooden wall is an idea we got from Austin. So most of the design and colors are from our lifestyle and what we like. But the second restaurant will look way different! Did you have any worries before opening? Philip: We had a little bit of worry, naturally, but then we saw our loyal customers from Fuji’s and now we aim to please them and new guests as well. We didn’t think we would be as successful as we have been though. Jennifer: We truly did not know we were going to be this busy! Every day we were surprised. On our opening day we had a number in mind for how many would show up, and we tripled it! But being on the strip next to these other great restaurants, there are just so many advantages as well! Philip: We opened in 2014. Jennifer: Our one year anniversary is coming up and we are very excited about that! What have been your biggest struggles? Jennifer: Storage and the parking lot. Philip: Aesthetics. And by that I mean the parking lot. It’s very hard to plan for the amount of people to come in if we don’t have any parking spots. We’ve had people park at the church down the street, and while that’s awesome that they are willing to do that, we want to be as accommodating as possible to our customers. It does hinder us, but at the same time there’s not much we can do. It’s really up to the landlords. Storage is also an issue since we don’t have the space for freezers to store food as needed. We can’t keep up! Jennifer: I mean we are seriously running to HEB everyday because we don’t have room to store stuff. Every week we do about 4,000 to-go orders in boxes. And that’s just boxes, that’s not counting food! Philip: We cut up 120 pounds of chicken everyday and then it’s all gone! So we’ll have to go to Sam’s Club or HEB to get more for tomorrow. Hashi Teppan Grill is located at 3388 Rebecca Ln, Abilene, TX 79606. Apart from being owners, what would you each say your main role is here? Philip: I would say we each take a huge role in whatever part of the restaurant we step into. Jennifer knows how to cook and I do as well, but I mainly stay in the back and help prepare the food. Jen takes care of the front and makes sure every guests feels loved and welcomed. Jennifer: It’s a good partnership! If I need help in the front then he’ll help and if he needs help in the back I can do that as well. We both know how to do everything, but we stick to our strengths and what we are better at! Is it safe to say you’ve grown up in the restaurant business? Jennifer: Yes. Our parents have helped us a lot. As kids we would be stuck at the restaurant and inevitably learned everything. When we were younger we would sit on this freezer and just watch people and watch how things were done. Philip: Yeah, we would sit there and watch how they worked for a long time. Jennifer: Even as little kids we would make the soup and salad and roll napkins! We really did grow up in it. When we left Fuji’s it was just a weird feeling, but now we came back and it feels better. So now we just excited to grow! So you are planning to open up a second location? Philip: The plan is definitely in motion, but I think once we grasp the concept of what we are doing now, we can see and move forward on what we can do better for the next store. It will be similar, but completely different at the same time. Interview written and conducted by Casey Hatcher. SO TELL ME ABOUT APPP . . .
We are so excited to finally be launching our BUH-LOGGG! And we couldn't be more honored to partner with fellow local enthusiast, freelance writer, and friend Casey Hatcher! Casey is the owner of Winter Project Co., a creative firm located in Abilene, Tx and will be the the voice of the APPP blog ya'll! In 2015 she began an endeavor of photographing the faces in her life, which she showcases on the Winter Project Instagram account. For questions or more information, check out her website at www.winterprojectcompany.com and definitely follow her incredible portrait project on Instagram where you might see some familiar faces @winterprojectco. Stay tuned as we go behind the scenes with some of our favorite local entrepreneurs, artists, musicians, or basically any person, place, or thing we choose to spotlight! As our first entry Casey will be interviewing Forrest and myself as owners and curators of A People Party Productions. How did A People Party Productions (APPP) come about? Jen: Originally it started with me being just a singer songwriter, needing a platform to play. The idea was to have an event, where I invited a bunch of friends to come and play whenever I booked at Mezamiz. Forrest came up with the idea of calling it APPP. It was just celebrating people. It came from an artist wanting to give other artists an opportunity to share their talent. So because it developed such a following, it grew from there? Jen: The first official craft fair was in the fall and we had about 20 vendors. It was one of the smallest, but one of the most memorable experiences. It really gave vendors in Abilene a whole new experience from what they’ve had in the past compared to like the standard 10x10 Civic Center booth. I was proud of how it brought a street market feel to Abilene that we haven’t really had. Forrest: I think Abilene is in a great position to grow. I feel like the arts are really important to the community, even though it might not be as widespread as others would hope. But I do feel like the arts are promoted and appreciated. Maybe that’s why APPP has been received so well, because it’s helped to further that. Jen: What I’ve noticed is that because we now have exposure to artists through social media and Etsy shops, there are more and more creators popping up around the area. I believe our community has a huge appreciation for the “shop local” experience and prefers buying locally or handcrafted. I’ve seen our vendors do really well at our craft fairs because there is a demand for handcrafted or custom-made in our area now more than ever. You’ve been doing craft fairs twice a year for the past three years. What is your overall goal for the future of APPP? Jen: In many ways we are still in the developmental stages of finding what our goal should be. We are recognizing that in order to bring a better product to the community of Abilene, we need to reach more within our area rather than just our town, so part of our goal is to reach Texas hand-makers who are looking for a quality event to apply for as a vendor. We want to bring those kind of things to our local consumers. The other idea is to partner with other communities and have APPP go mobile. Forrest: I don’t think APPP is limited just to the craft fairs, even though those are the main events at this point. As far as goals, I feel like what Jen is really gifted at is making APPP an umbrella for all things promotion. The craft fair is about promoting local, handmade. But I feel like APPP is also about promoting music, culture, and everything local. Jen: When we started APPP we said “local business, organizations, artists and musicians”. It’s not limiting, but we focus on local. Our definition of local doesn’t mean just Abilene, it just means not a chain. We are also seeing that we have become a “launchpad” for many of our local artist entrepreneurs who have been vendors at our craft fairs. We hope to further the development of our branding consultation and possibly offer workshops in the near future. Becoming Members of the Chamber at the Spring 2015 Craft Fair. Do you have a stipulation on who is a vendor? Jen: We want to. We are looking for unique, handmade items. What we’ve found is that from year to year we’ve had to change things. With each event, we cater to the vendors on our list. But we really try to refrain from vendors who represent a product line that isn’t their own. Although we appreciate their entrepreneurial spirit, our priority is giving unique, handmade items first dibs! Are we going to see the same vendors every year? Jen: One of the things that I recognize needs to be apart of my responsibility, is to look for the next best thing. For us, it’s bringing people something new but also continuing to service the vendors who return each year and who have been great to work with. One of the cool things about our events is that every single business who is representing themselves takes a lot of pride in what they do. So they are going to bring their best! What are some new things happening this year? Jen: This is our first year we’re going to be venturing into commission. It’s a full time job and a business. Right now we feel like the best option is to keep our rates lower, with a commission of 10%, and work off the honor system. We’ll have some simple tools for vendors to keep track of their sales. We are also looking for commercial sponsors. What we’ve learned is that in order to host music and fuel culture, we really need the financial backing from that. You have been married for 5 years. Describe what the two of you do. Jen: This is my first time to be completely self-employed, I guess I would call myself a promoter. I want to help businesses that have a great product, but need help with pulling their brand together. Forrest: Well Jen is also full time wife, a full time mom, and she’s also a musician. But I work for a non-profit called the Palm House. We have several mentoring programs for kids and do neighborhood outreach. We also feed the homeless. I guess we’re basically a neighborhood ministry. Since I’m the only full-time employee I wear a lot of hats. And then I’m crafty too! I’ve heard you’re quite the craftsman! Tell me about the tables you’ve been making. Forrest: Well part of the model for the mentoring programs we have is to have it be like family. Part of what we do is we eat a meal with these kids. I wanted for it to feel like we were all sitting around one big table. At the time we had three small tables in this dining room, so I decided to build a 12 foot table we could all sit around. I ended up building a table for the Palm House and I just put a picture of it on Facebook, then all of these people were like “I want one! I want one!” So I started taking orders. I build them all from reclaimed wood. Is that something you would like to continue doing? Or is it just a side deal? Forrest: I don’t know, Jen has been good at promoting me, but with what I feel God wants my priorities to be, it’s just a side thing. I really enjoy it, but I feel like Palm House is my main priority and this is just kind’ve a side project. Maybe this is just in the circles I run in, but I feel like when people stumble upon really talented individuals, they want to support and buy from them. It sounds like that’s happened for you. Forrest: Yeah, that was surprising to me! I had no expectations. I just did it for my job and it happened! A few of Forrest's first tables and a glimpse of his gardening! Yum! Let’s talk about the Food Truck Courtyard. Where did the idea come from? Jen: One night in May we were kind’ve needing some inspiration and Forrest suggested we just drive around and look for a lot. We'd been talking about this idea for a while now. This was probably back around May or so. Forrest: We drove around and narrowed it down to three prospects and pretty quickly figured out where we wanted it to be. Jen: I think we saw that there was sustainability here for the food trucks. So we spoke to the city and got everything fully approved. At this point we have everything ready to go, we just need start-up costs. However, we may just run with what we have once we get our general insurance and contracts in place. We can start now with less, or wait till later to launch with more of what we're going for...but we can't bear missing out on this fall weather! One of the most exciting parts to me is incorporating our vendors into a monthly outdoor market experience and bring more live entertainment to the downtown area. Awesome! Well it sounds like you guys have a lot going on, but are loving every minute of it. Is there anything else you'd like to share about APPP or you guys? Forrest: I would say these things pretty much sum up me and Jen. We always enjoy hosting and connecting people—whether it’s at our house with parties in the backyard or whatever. I think our ideas get birthed out of wanting to create space that people can come and enjoy. Whether it’s at our home, our craft fairs, or downtown. In my mind, that’s the heart behind APPP, the food truck courtyard, and us as a family. We loving hosting, we love hospitality, we love creating a space where people can come and connect. Jen: APPP is a natural passion of mine - to promote others! I feel like our community is embracing our local businesses, organizations, artists, and musicians more than ever, and we are happy we get to be a part of it! First People Party Event (unofficially pulled-off at The Cloisters) with musician friends and family. First People Party Event (unofficially pulled-off at The Cloisters) with Forrest Harmel and Trevor Allen of The Ninja Joy Squad. Our second People Party Craft Fair at The Cloisters once we got vision to reach out to the vendors to join in on the live music line-up. Our Spring 2015 Craft Fair after three years from our first event. My how we've grown! Going behind the scenes with the locals in our area! This is where we get to know the creatives a little more! Behind the scenes, stories, tips, and more!